Many courses have since folded and/or sold out to developers. But the economic storm clouds are beginning to part, suggests Toronto’s Tom McBroom, one of Canada’s heavyweights in the golf architecture arena. Golf communities might well feed that recovery. 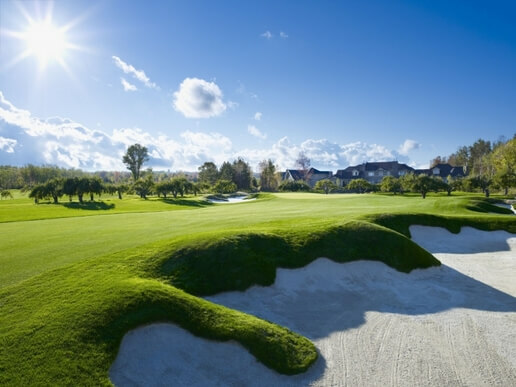 “The majority of new golf courses built today are typically developed in association with some form of residential or resort development,” explains Doug Carrick of Don Mills-based Carrick Design, who along with McBroom have sculpted most of Canada’s “Best New Course” winners over the past 20 years. “The costs associated with building and maintaining today’s courses often necessitates the development and sale of surrounding real estate in order to create a successful business model for golf,” says Carrick, whose golf course community partnerships include Ballantrae Estates in Stouffville (Schickedanz Bros.), RiverBend in London (Sifton Properties), Cobble Beach in Owen Sound (Cobble Beach Golf Resort Community/Georgian Bay Villas and Reid’s Heritage Homes) and Muskoka Bay in Gravenhurst (Freed Developments)—the last two of which, in particular, have claimed multiple provincial and national awards. He’s also working on a new course at Friday Harbour on Lake Simcoe, as part of a development with Geranium and the Pemberton Group. Today’s golf community plans, though, are a far cry from those of a little over a generation ago. At that time, logic dictated lining as many fairways, tees and greens with the backyards of as many homes as possible. Arriving closely on the heels of that philosophy, of course, were multiple lawsuits resulting from errant golf balls striking private property. When it was overseeing its Millcroft development in Burlington during the late 1980s, in an effort to foster goodwill, Monarch Homes would replace windows broken by golf balls at no charge for the first five years after someone purchased a home. The builder also spent an estimated $25,000 a year planting trees in strategic locations to prevent further damage to homes. Located just outside Honey Harbour, 90 minutes north of Toronto, the four-season master-planned community features the Residences of Oak Bay, complete with a marina (under construction), fitness facilities, swimming pool, walking trails and other lifestyle amenities. The centrepiece, the Shawn Watters-designed course that opened in the fall of 2010, is highlighted by one of the most memorable par-3s in Ontario, a stunning 170-yarder over wetlands to a raised green perched upon a granite outcropping. While Eden Oak took a long-term approach by unveiling the golf course well in advance, nobody has demonstrated more patience than the folks at Cobble Beach Golf Resort Community and Georgian Bay Villas. Having purchased 574 acres on the shores of Georgian Bay in Owen Sound in 1998, Willis McLeese and his son Rob opened the Doug Carrick-designed Cobble Beach on May 22, 2007. With only 29 completed homes to date, there are eventual plans for 1,000 residences as part of a 20-year project that relied heavily on the expertise of Reid’s Homes in the early stages, according to McLeese. Although the development has focused on advanced environmental practices, the golf course is the primary lure. Most of the single-family homes range from 2,200 to 4,000 square feet and average between $700,000 and $900,000. McLeese estimates a premium of $100,000 for homes situated on the property, versus a location in a generic community elsewhere in Owen Sound. Business models vary, though. In London, Sifton’s affordable and award-winning RiverBend residences are propped up by an underrated 2002 Carrick design—run separately from the community—that maximizes the backdrop of the Kains Woods and the rolling contours of the development. The development is a leased-land community, with 49- and 99-year lease options—each averaging in the $700-a-month ballpark, although a new 52-home release—the 13th Green at Riverbend—runs around $1,200. “A site that allows for dramatic grade separation between golf fairways and elevated home sites will provide homeowners with more privacy and is not as intrusive visually and psychologically to golfers as a site with flat, open terrain that is devoid of trees,” adds Carrick. 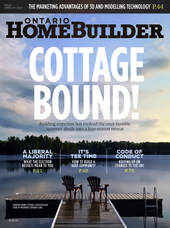 That marketing strategy, as with other elements of any new development, can benefit from good environmental practices. “Sustainability, including the recycling of storm water along with the use of effluent water for irrigation purposes, is a critical element in land planning for golf course communities today,” says Carrick. “It also provides a method for improving the quality of runoff from developed areas. Beyond increasing land value, protecting greenspace and desirable views for as many of the potential residents as possible is an excellent way of creating a sense of place and value that extends throughout the entire development,” suggests Carrick. Similar value can be attained through the golf clubhouse, which can serve as a great gathering place, not merely for golfers but for family meals, weddings and other events. Consequently, positioning it “in a prominent location with scenic views over the surrounding countryside and over the golf course can help to establish a strong identity and sense of community.